Waterford IT graduates David Corbett from Liscullane, Corofin, Co. Clare and Robert Tobin from Kish House, Arklow Co. Wicklow were the recipients of a beautiful certificate presented by Agriculture Minister Michael Creed following their success in the Dairymaster Ag Science bursary awards. The award recognised the achievements of BSc (Hons) in Agricultural Science students with the best final year project presentation, and was judged by a panel of experts from Dairymaster, Teagasc and WIT. 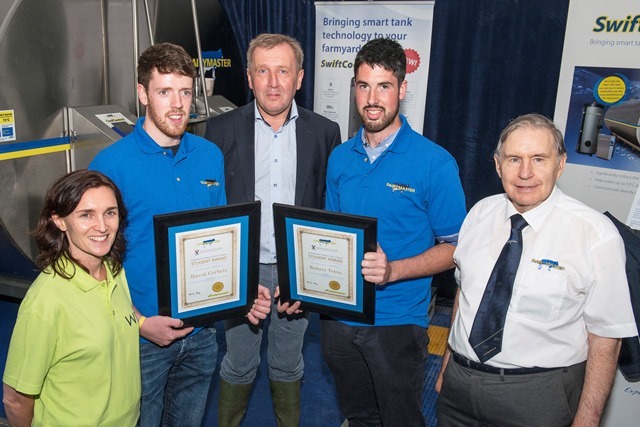 Both David and Robert were presented with a certificate at the Dairymaster stand at the Ploughing Championships by the Minister for Agriculture, Michael Creed and CEO and the CEO of Dairymaster, Dr. Edmond Harty. David Corbett is from Liscullane, Corofin, Co. Clare and Robert Tobin is from Kish House, Arklow Co. Wicklow. David Corbett (22) comes from a suckler and beef farm. His thesis, titled, ‘Different performance and sward characteristics of five contrasting swards of different ages from the same grass mixture’ provided him with the opportunity to show what he learned in Waterford IT. Robert Tobin (21) is from a beef and sheep farm near Arklow in County Wicklow. His final year research project was an investigation into “The Effects of Feeding Sodium Bicarbonate as a Rumen pH Buffer to Finishing Cattle”. However the family are currently switching to dairy farming. His final year research project was an investigation into “The Effects of Feeding Sodium Bicarbonate as a Rumen pH Buffer to Finishing Cattle”. Also in attendance was programme leader for the BSc (Hons) in Agricultural Science, Dr Michael Breen and Dr Elaine Duggan who commended both Dairymaster and Minister Creed for their part in the event. Parents and prospective students considering agriculture, agricultural science or horticulture can read about courses at www.wit.ie/courses.